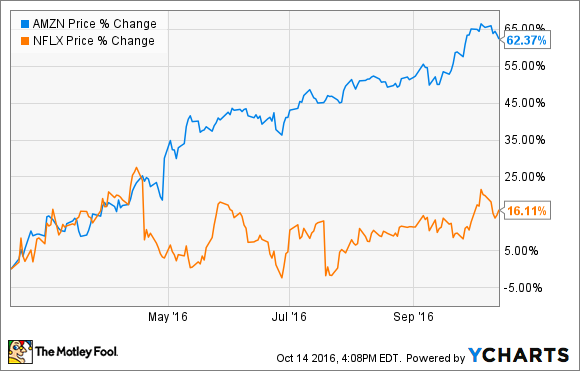 After Amazon stock soared 63% since February, is it still a better buy than Netflix? A head-to-head comparison of Netflix (NASDAQ:NFLX) and Amazon (NASDAQ:AMZN) is likely to show up more and more in the future. While at their cores, Amazon is still an e-commerce company and Netflix is a streaming-video giant, Amazon's ever-expanding flywheel of benefits for its Prime members is increasingly crossing paths with Netflix's streaming business. Not only does Amazon now have its own streaming video subscription service, which it calls Prime Video, but the company is rolling out a growing library of original content and exclusive TV, akin to the Netflix Originals and content deals that have made the streaming company a must-have entertainment destination for 83 million paying members. As these two companies inevitably duke it out, which stock is a better buy? Investors who buy shares of either company are getting a fast-growing company with enduring growth prospects. With trailing 12-month revenue increasing by 25% year over year in the trailing 12-month period, Netflix is benefiting from its ongoing international expansion, as well as from well-justified price hikes for its streaming service. As Netflix Originals prove to be driving value for customers, and as the company continues to benefit from the secular growth of streaming video, both of these catalysts for growth look poised to continue driving revenue for years to come. Amazon's trailing 12-month revenue similarly increased 26% year over year, driven primarily by rapid growth in e-commerce, but also helped out by a notable 58% jump in the company's Amazon Web Services (AWS) division, which accounts for about 9% of total revenue. As a leader in both of these segments, there's no sign of either slowing in the near future. Given that Amazon stock has skyrocketed 63% and Netflix stock increased a much less 16% since I compared these two stocks in February, it might seem like Netflix stock would be the better buy today. But choosing between these two stocks isn't so cut and dried, as Amazon stock still appears to be the less risky bet of these two -- even after its massive rise. Sure, trading at 71 times estimates of next year's earnings, Amazon stock certainly isn't cheap. But Netflix's much higher price-to-forward earnings ratio of 128 highlights how investors are betting on much greater earnings growth for the streaming giant than they are for Amazon. And it's worth noting that, while Netflix is the undisputed leader in streaming movies and TV shows, competition looms in the media space as far as other companies with powerful video content. Powerful companies like Disney, Time Warner, and Alphabet's YouTube look like potential threats. Amazon, on the other hand, has unprecedented scale in e-commerce, and is highly differentiated from other large retailers, such as Wal-Mart and Costco. Despite's Amazon's soaring stock price since I last picked it over Netflix in February, I'm still betting Amazon is the better buy. This is a particularly timely topic because both companies report earnings this month. Netflix reports third-quarter results after market close on Monday, October 17, and Amazon reports third-quarter results after market close on Thursday, October 27. Investors can look for more color on both businesses when the results go live.